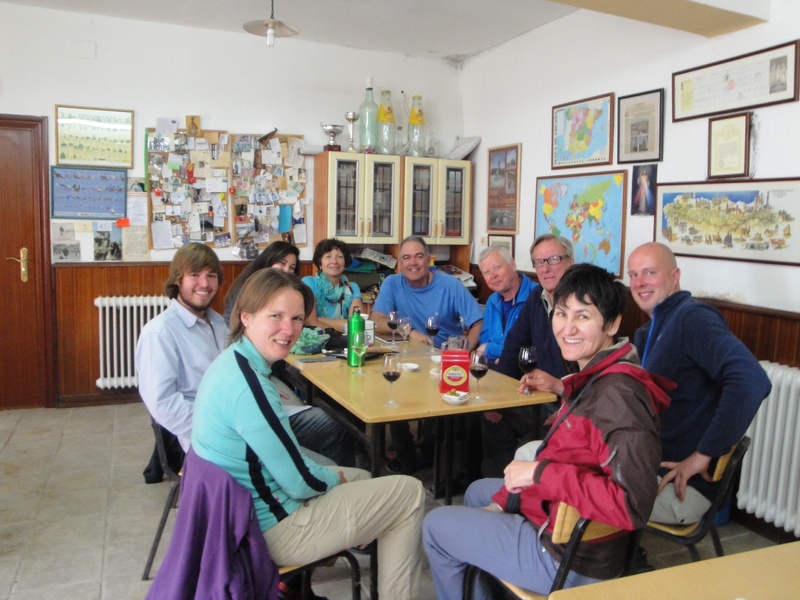 « Day Minus 1 to the Camino – We’re ready to walk! We left Burgos at 0800 this morning in the 38 degree Fahrenheit rain. We were well prepared with our rain pants, rain jacket and rain cover for our backpacks. We exhibited the type of energy and exuberance of the first day of the Camino. We saw the occasional fellow along the way. All seemed to have determined faces but would still share a smile or a wave to fellow pilgrims. Once we left the city and suburbs and started on a dirt packed train with the state prison to our right, we noticed a staggered line of pilgrims behind us. The first to reach us was a young man. “Buenos dias” I said to him. Buenos dias was his response. De donde eres? I asked him. He responded in accented English that he speaks very little Spanish. We then shared about the next 2 kilometers of the Camino. His name is Tamas, from Budapest, Hungary. He started his Camino at St. Jean Pied du Port on May 5th. 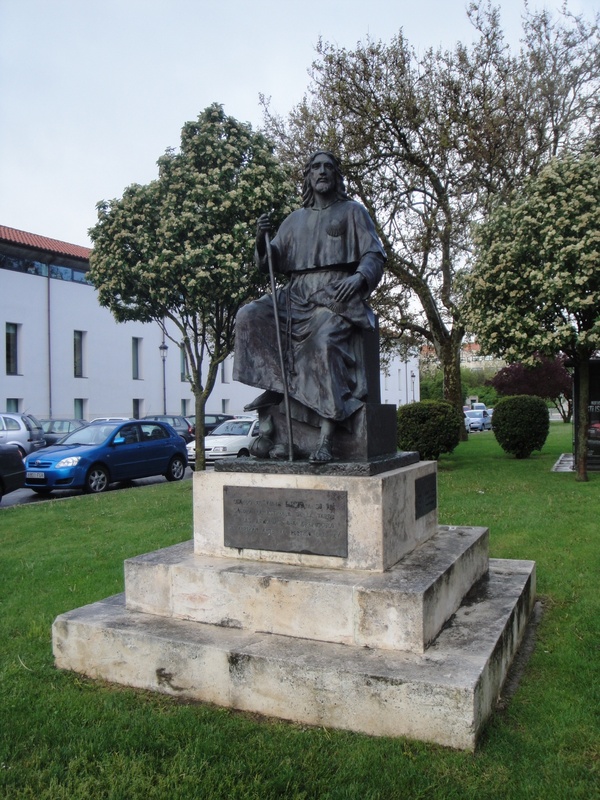 He walked 44 kilometers yesterday reaching Burgos last evening. He was planning to walk about 30 kilometers today. 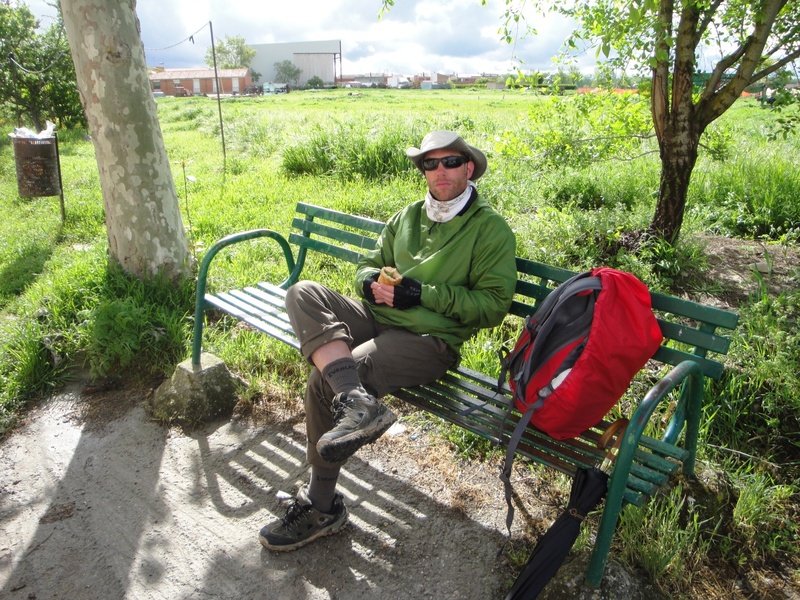 Tamas was friendly and shared that one can usually tell who is new on the Camino by their energy and eagerness to talk to people. He said that typically, after walking for a week or more, people are hurting with at least one part of their body aching with blisters, back pain, knees or ankles shooting pain with every step. A Korean zipped past us and shared the walk for about 2 to 3 minutes. His name is Kim Yu Jing and started the Camino at St. Jean the same day Tamas did. Yu Jing was keeping a very focused quick pace and was soon well passed us. I was taking pictures along the way and Nancy and Andrea stopped for a few minutes. 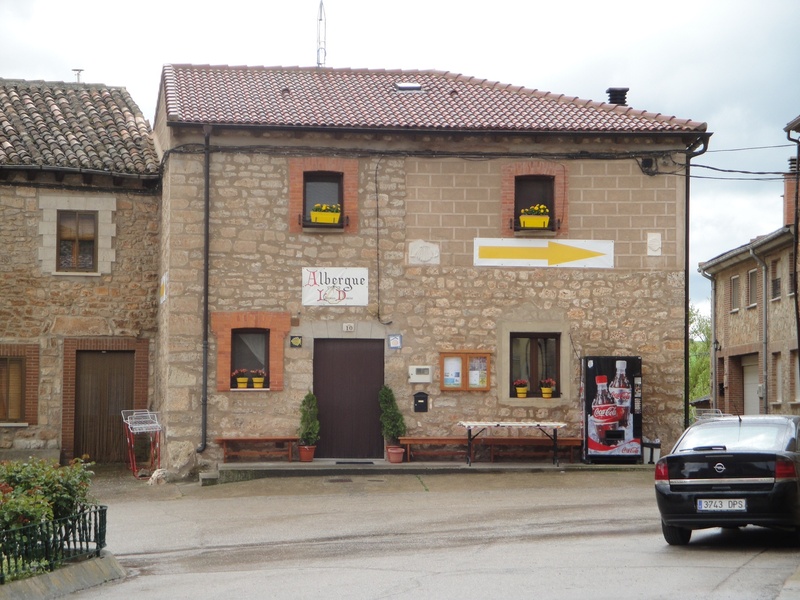 We parted ways with Tamas as we entered the village of Tardajos, 11 kilometers outside Burgos. As we walked through this village and started walking away from the N-120 Highway, I found Tamas again relaxing at a bench eating a bocadillo sandwich. He soon passed us by and at his pace, well likely not seem him again. There about 14,000 people walking the Camino right now. I realize we’re all spread out throughout Spain but it surprised me to see how many fellow pilgrims we saw. I was determined to take the advice of Paulus, the Dutch born Canadian we found at the Spanish restaurant yesterday that we should pace ourselves and not walk too far at the beginning of the Camino. It started raining again and we started climbing up hill. 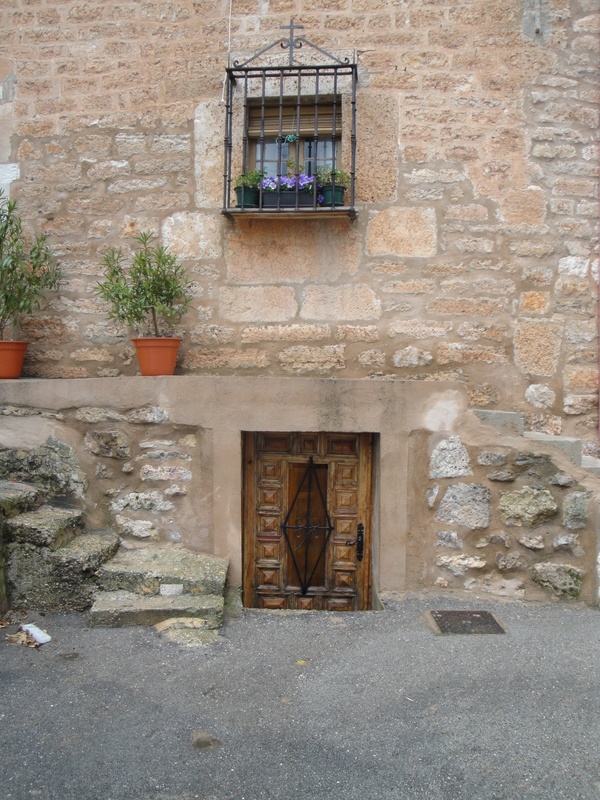 We reached the village of Rabe de las Calzados at 1100 this morning. This is a very scenic little town of 190 people. That is only a total of 12.3 kilometers of walking but at the same time, I don’t want to fall for the thought that “I’m feeling good so let’s push further.” I took Paulus’ advice and we stayed in this village. Since it was now only 1115 and the Alberque didnt open until 1230 we walked to the local Cafe for a cafe con leche. The owner was very friendly but didn’t speak English. I’m finding already that very few Spaniards along the Camino speak very much English. We checked into the Liberanos Domine Alberque in the small town center plaza dominated by a beautiful old church. Clementine, the lady running the Alberque very efficiently registered us and stamped our pilgrim’s passports. We’re in a small room with 4 bunk beds and a single bed. Very cozy! We showered, washed our clothes for the day and walked down the hill back to the cafe taking pictures along the way. Before we reached the cafe we saw Paulus and Annamieke on their way to the next village! People really do run into each other on the Camino! The true spirit of the Camino came out at the cafe. Within minutes all the Pilgrims gathered and put tables together and started sharing their Camino experiences. Very interesting conversations! I spoke to Thomas, a man only a few weeks older than me from outside Goteborg, Sweden. We had a very engaging conversation. Our table also consisted an Irishman, a woman from South Africa, a couple from Holland, a young university student from Austin, Texas, a woman from Germany, and those three Americans from Colorado. We’ve only walked 14 kilometers today but it was a very good day! Maybe we’ll walk a little further tomorrow. We’ll see! We only have 486 more kilometers to go! Buen Camino! True international gathering at the local Cafe. We’ve survived our second day on the Camino. Nancy and Andrea are both writing their own journal by hand each day. We might be able to capture some of their thoughts later on in the on this website. Glad to hear of your great first day! May you enjoy a restful night and a good second day tomorrow. So many different people with such a diverse background and area of origin! Sounds like meeting new folks is going to be the best part of your walk! Wow the pictures look awesome mr . Gomez. The blog is great make it feel as if we are walkimg right alomg with such great detail. Glad you guys are enjoying it all.